My name is Garry Ramsay and I have developed two coaching systems that I believe will help every junior and senior AFL coach. 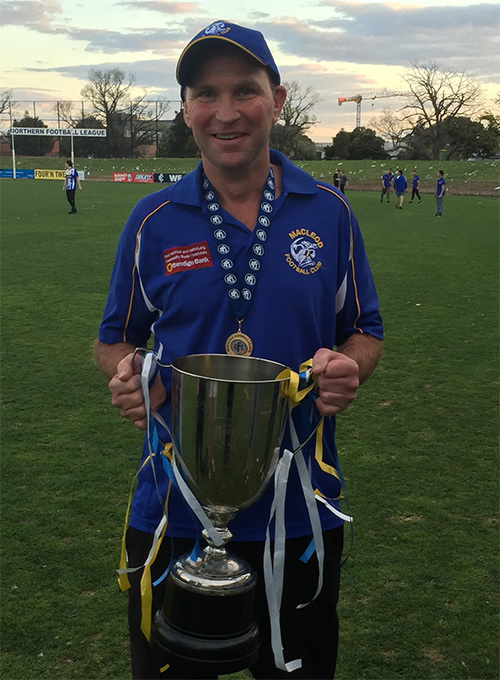 I am a 47 year old who started playing AFL football in the under 10s, and I finished playing when I was 33, with my last 2 years spent as a playing coach. I started playing senior football at age 17 and made many friends throughout my career. I played in 3 senior premierships, however, the highlight of my career was playing football with my 2 brothers while my family watched on. Like many players I had a number of injuries during my career, including 4 knee operations, which meant plenty of time on the sidelines, and this helped me develop my interest in coaching. I have coached Auskick, junior and senior football over the past 20 years, and every year I have seen many highlights. I found that different teams and individuals needed various teaching methods to help them achieve their goals. Two Senior Premierships in the last 5 years has given me the confidence that I’m on the right track with my coaching systems. My passion for coaching AFL football has increased every year, and I enjoy talking to other coaches about their planning, systems and philosophies. I have learnt from these conversations that the main reason people stopped coaching was the preparation time required and dealing with players and parents dissatisfied due to lack of ground time. I want to help every coach enjoy football without these unnecessary distractions. My Coaching System will give you the structure that allows you more time to enjoy coaching, and less time doing paperwork and dealing with players and parents’ concerns around fairness. This system gives you a simple structure to work with, and at the same time allows you to set your own game plan and follow your own coaching philosophies.